The Great Katharine Hepburn: Louise Beavers, What A Character! The Great Katharine Hepburn has relocated to margaretperry.org, where you will find even more amazing reviews and commentaries on films from the classic era to today! 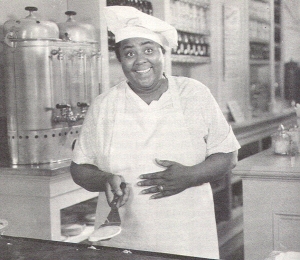 Louise Beavers, What A Character! This post is written in conjunction with the What A Character! blogathon hosted by Once Upon a Screen, Outspoken and Freckled, and Paula's Cinema Club. In fact, Beavers detested cooking and never had children of her own. Born in Ohio and raised in Pasadena, California, she had to learn how to talk like she was from the South. The daughter of a school teacher, Beavers sang in her high school choir, and eventually became a member of the Sigma Gamma Rho sorority, one of four historically African American sororities. Beavers had her first taste of show business as a member of the Lady Minstrels, who performed amateur productions on the Vaudeville circuit, and then as personal made to silent screen star Leatrice Joy. In 1927 Beavers landed her first role in a motion picture - UNCLE TOM'S CABIN. 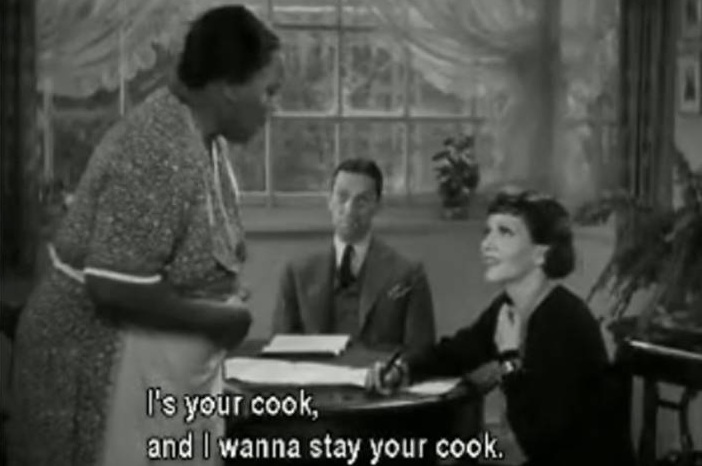 The role that won Louse Beavers respect as a legitimate actress was Delilah Johnson in IMITATION OF LIFE (1934), starring Claudette Colbert, Ned Sparks, and Fredi Washington. When working single mother Bea allows Delilah and her daughter Peola move in for exchange for food and lodging, the two women become friends. Bea has taken over her husband's maple syrup business, and when she discovers Delilah has a special secret pancake recipe, she sees a business opportunity. The two women open a pancake restaurant, and when a slick city businessman (Ned Sparks) suggests that they box the pancake mix, the two women make a fortune. Delilah's daughter, Peola, has very light skin, and she struggles throughout the story to find her place in the world. Bea's daughter Jessie also has her own cross to bear when she unintentionally falls in love with her mother's fiance. Both families trust in their love for each other to see them through the good times and the bad. Peola: "I'm not black! I'm not black! I won't be black!" Bea to Jessie: "How could you say such a mean cruel thing to Peola?" Jessie: "I didn't mean anything." Delilah: "It ain't her fault, Miss Bea. It ain't yours and it ain't mine. [To camera] I don't rightly know where the blame lies. It can't be our Lord's. It's got me puzzled." Delilah: "Look here, baby, you go down South to one of them high-toned colleges where only the high-toned goes. Wouldn’t you do that for me, honey?" This contradictory stance is fairly typical of Hollywood's position about racial inequality. Sidney Poitier would run up against many of the same problems in his career, although the changing times, and his gender, permitted a certain amount of progression from Beavers' Mammy in IMITATION OF LIFE. On the other hand, Beavers' performance progressive in that she was given almost as much screen time as Colbert. Also, for the first time, the problems of an African American working mother were shown to be as equally important as a white working mother. The problem of racial equality was directly addressed, though not resolved, within the space of the movie. The concerns of working women were central to the plot, and the contrast between the two situations, and how the women support each other to negotiate their problems, projects a very early positive, harmonious model of inter-racial cooperation. There are a lot more things that could be said about IMITATION OF LIFE, but I think I'll leave it there for now. It is certainly not the only film in which Louise Beavers gives an outstanding performance, though it is definitely one of her best. Over her career, Beavers would support some of the best leading actors and actresses of the day, including Myrna Loy, Mae West (the two became close friends), Mary Pickford, Constance Bennet, and Jean Harlow, Cary Grant, Bing Crosby, and William Powell. In 1952 she took over the role of "Beulah", the first sitcom to feature an African American as the primary character, from Ethel Waters. 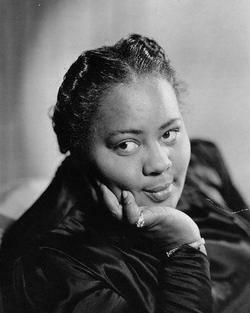 Louise Beavers made more than 150 films in her long career, passing away in 1962. Good job. I've always felt that the original version of "Imitation of Life" was superior to the remake because of the way the relationship between Beavers and Colbert's characters develop, as you note. Their friendship is much more believable to me than the one between Lana Turner and Juanita Moore. Racial stereotypes aside, you really believed that Colbert and Beavers would do anything for each other. Beavers is believable and incredibly touching as the self-sacrificing mother of the confused Peola. She did her best under the worst, at times, of circumstances. And isn't that what all mothers do. Again, good job! Yes, you are so right. The relationships in this version are very realistic. Glad you liked the post! Great post, Margaret, as always and a wonderful entry on an actress with a memorable career. Great addition to WHAT A CHARACTER! It occurred to me, I might add, sadly only as I read your commentary that it never occurred to me before -Ms. Beavers was as much a central part of Imitation of Life as was Colbert. By that I mean that it's so easy to "buy into" the stereotypes that a depiction of a maid, even in a leading role, remains secondary in our minds despite what we are actually seeing. I hope that makes sense. And it's too bad - wonderful actress, always memorable. Imagine if she'd been granted the chance to show her range in non-stereotypical parts. I think I see what you are saying. It's one of those things where they are so close, and yet... not quite there yet. I still love the movie and all the performances in it though. Thanks for commenting! Thank you for this post Margaret, I learned a lot. I agree with Aurora above, Louise Beavers would have done some even better work in better parts. I didn't realize she made over 150 films! She was a busy woman! Just wanted to say thanks for posting about an actress of color. This is the second blog on an African-American character actor I've read in the past two days and it's so refreshing to see it. My honour entirely. I think one of the most important aspects of film history is paying homage to those performers who were not properly recognised in their own time. An excellent post on a most beloved actress. She deserves to be remembered for many things, not the least of which is her own intelligence and her endurance in an industry that limited her. She appeared in many films during the 1930's, that's impressing! 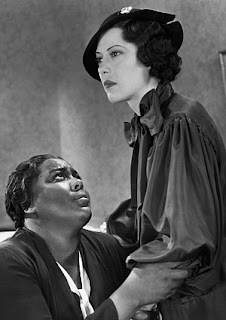 I haven't watched Imitation of Life yet, but I remember her in Holliday Inn. Can't wait to hear your thoughts!